This fifth Toolkit in the popular series developed by Quanterion reflects the updated focus in RMQSI. Several of the same Quanterion staff members have been involved in all five titles in the series. Over 30 new topics have been added, and several others updated, with a minimum removal of topics from the “System Reliability Toolkit”. In addition, Appendices have been added stressing the practical application of the document’s practices throughout a program’s life. To accommodate the new and updated material, the format of the book has been increased to a full 8-1/2 by 11 page format. The new/updated material represents an almost 30% increase in Toolkit content within the expanded volume of over 900 pages. In 1988, the USAF Rome Air Development Center (RADC) used the benefit of over 30 years in the reliability discipline to publish the RADC “Reliability Engineer’s Toolkit” and, in 1993, a revision, the “Rome Laboratory Reliability Engineer’s Toolkit” was released (Rome Air Development Center was renamed Rome Laboratory (RL) between the two versions). These documents were widely distributed and used by both the commercial and military communities. Over the last 35 years, the Reliability Information Analysis Center (RIAC), formerly known as the Reliability Analysis Center (RAC), along with serving as a centralized reliability data and information center, has worked on hundreds of reliability projects. 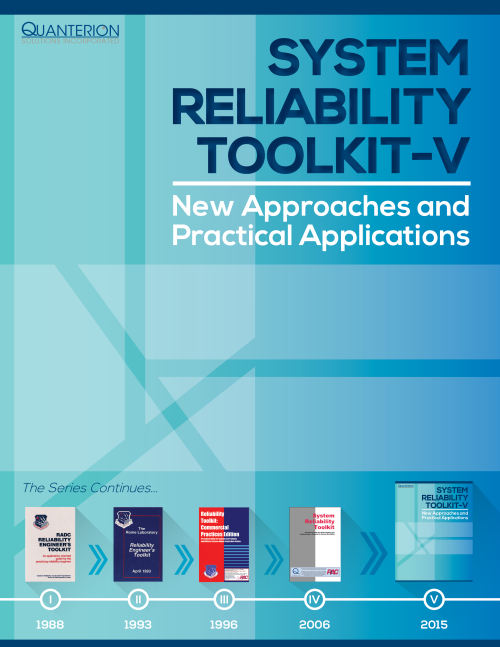 Because of the vast experience base of these two organizations, it was only natural that, in 1995, RL and the Center collaborated on a new Toolkit that emphasized commercial reliability practices. The “Reliability Toolkit: Commercial Practices Edition” became a popular successor to its earlier editions, with thousands of copies in circulation. With DoD downsizing and strategic shifts in technology focus, the reliability charter that was once part of Rome Laboratory transitioned more visibly to the RIAC. The need to address system reliability as part of the “bigger picture” took on an even greater significance as the world stage became increasingly dangerous, dynamic and complex (as it continues to do in 2015). The “System Reliability Toolkit”, released in 2006, represented a major expansion of previous editions of the Toolkit series. It continued to concentrate on activities that have payoff, but extended its coverage beyond hardware-centricity to more distinctly address the contributions of software and human factors to overall system reliability. Having expanded its content by 70% over its predecessor, the “System Reliability Toolkit” represented a significant revision to our previous work. It included numerous new topics that were added and modified to better represent every aspect of system reliability over its life cycle. In 2008, the DoD recognized that the intended consequences of Acquisition Reform in the mid-1990s were not being realized. The replacement of Military Standards and Handbooks with commercial standards and guidance documents were having a negative impact on the overall Suitability and Reliability, Maintainability, Quality, Supportability and Interoperability (RMQSI) of acquired systems. Numerous studies, Reliability Improvement Working Groups (RIWGs), new policies/instructions and the Tech America (now SAE) joint government/industry standard ANSI/GEIA-STD-0009 have facilitated efforts to revitalize RMQSI. The result is increased emphasis on early (and more accurate) definition of RMQSI requirements, reliability growth principles initiated in the earliest phases of a robust systems engineering Design for Reliability (DFR) process, and overall clarity on the need to consider Affordability as part of the overall DoD Better Buying Power initiatives. Whether you represent industry or government and deal with materials, parts or systems, or with hardware, software or human factors, we think you will find the “System Reliability Toolkit – V: New Approaches and Practical Applications” to be a valuable successor to the RIAC “System Reliability Toolkit” in both planning and carrying-out those activities with the biggest payback to your organization and to your customers.